The bestselling Roy Grace series from award-winning crime writer, Peter James, is now available in audio. 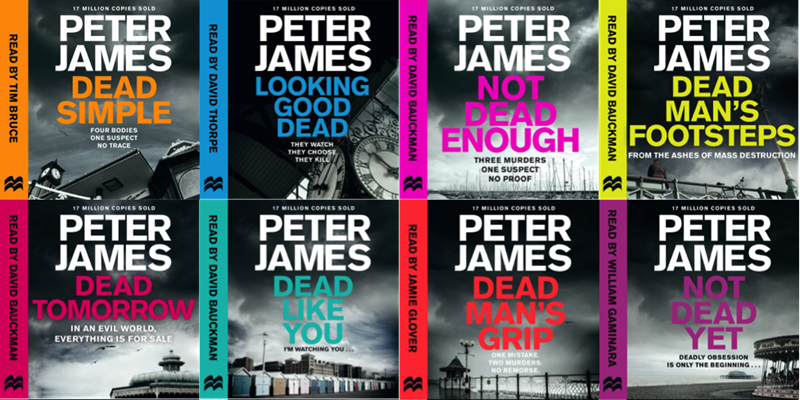 Peter James' bestselling Brighton-set crime series, featuring Detective Superintendent Roy Grace, is now available in audiobook. Here's Peter in the studio listening to Daniel Weyman recording the latest novel in the series Love You Dead. Start listening to Dead Simple, the stunning first novel in Peter James' Roy Grace series now. It was meant to be a harmless stag-night prank. A few hours later Michael Harrison has disappeared and his friends are dead. With only three days to the wedding, Detective Superintendent Roy Grace - a man haunted by the shadow of his own missing wife - is contacted by Michael's beautiful, distraught fiancée, Ashley Harper. Grace discovers that the one man who ought to know Michael Harrison's whereabouts is saying nothing. But then he has a lot more to gain than anyone realizes, For one man's disaster is another man's fortune . . .
twelfth novel in the series, Love You Dead, May 2016.